In the past I have always ordered Providence vital records through the mail. But today I thought I would venture over to Providence City Hall, 25 Dorrance Street, myself, and see if I could just look at the record book that I wanted. 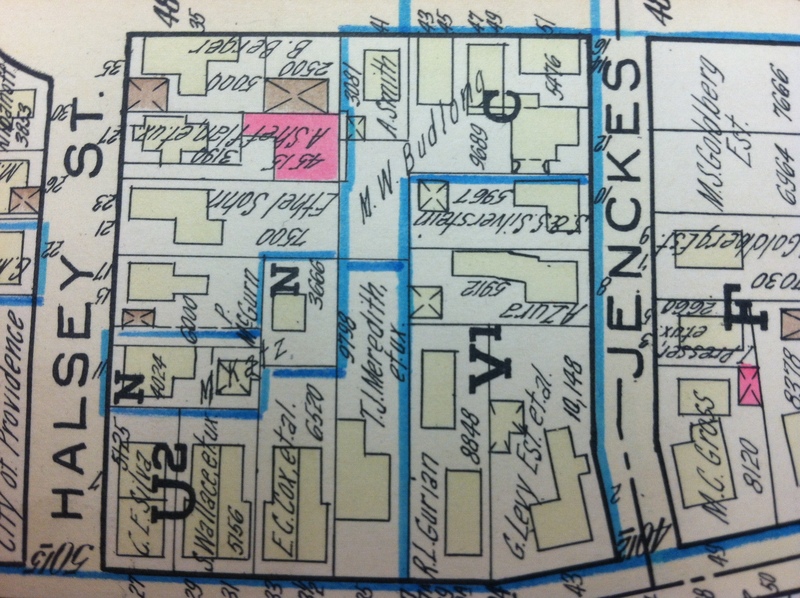 I was looking for the death record of my gg-grandmother Jessie MacLeod Murdock. One never knows how such a mission will go. I circled the block several times and managed to find a legal parking place on Washington Street. That was extremely lucky. Meter was broken; also extremely lucky. 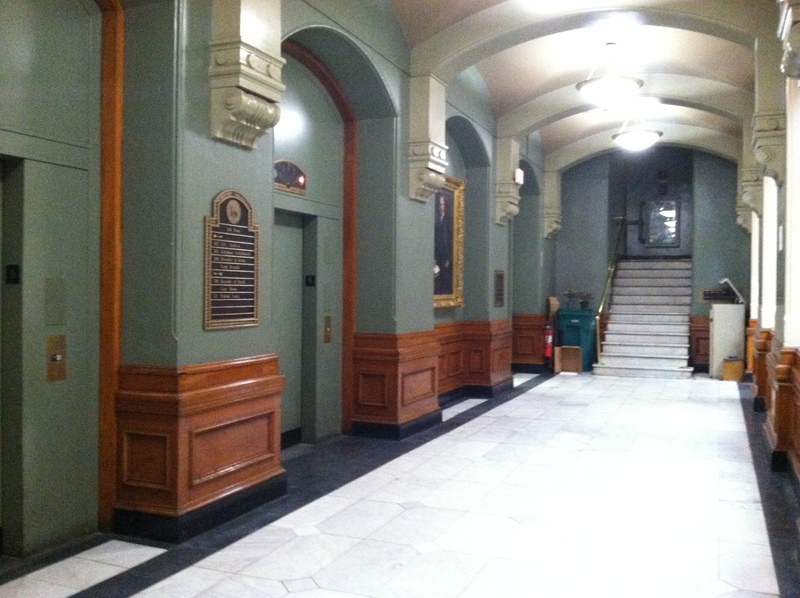 The City Hall is a beautifully dour 1878 building. 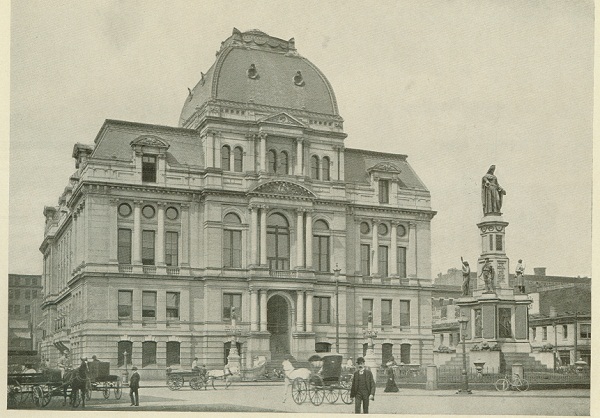 A turn of the century view of city hall; it looks much like this today. I knew the Vital Statistics office was on the first floor. 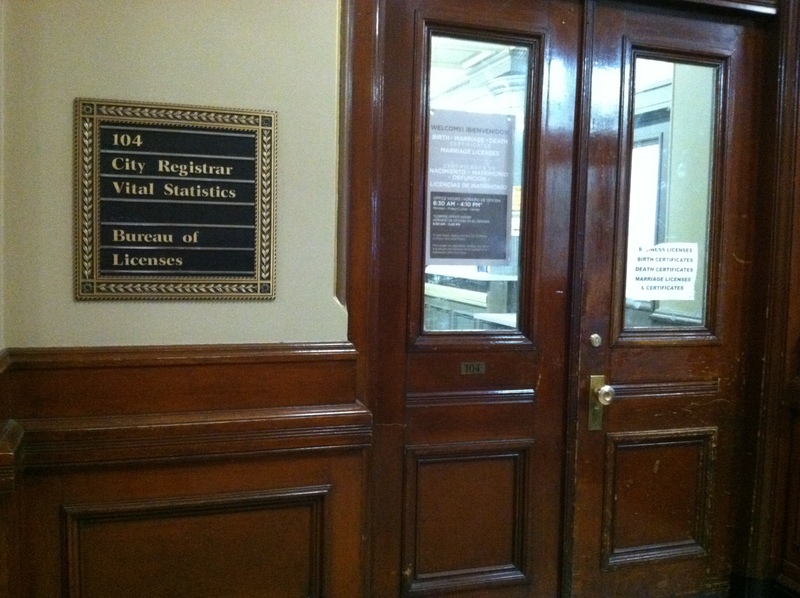 The Vital Statistics office is for modern records only. I ventured in and inquired. 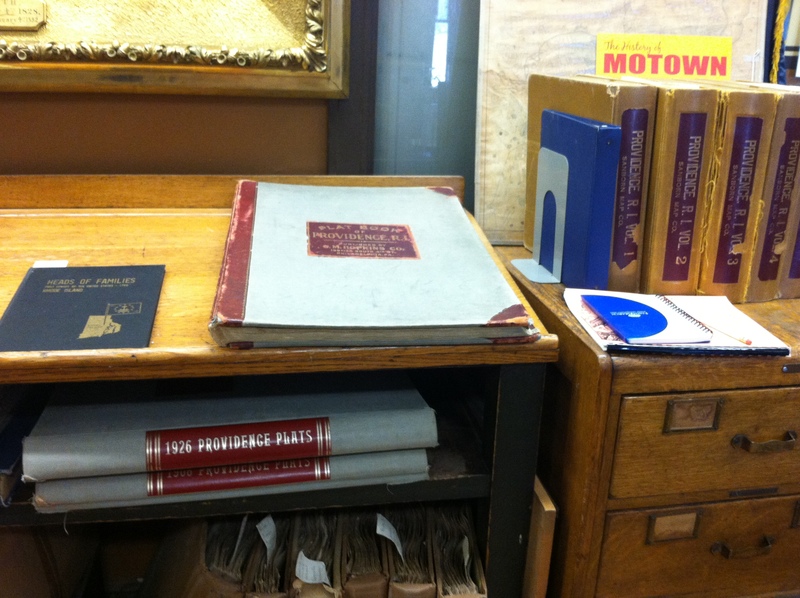 The clerk said for a 1936 record I needed to go to the city archives on the fifth floor. Really? That sounds like fun. The building itself is fascinating. There is always some kind of renovation underway; today I saw a “portrait restoration project” going on in a hallway, with a restoration specialist hard at work. 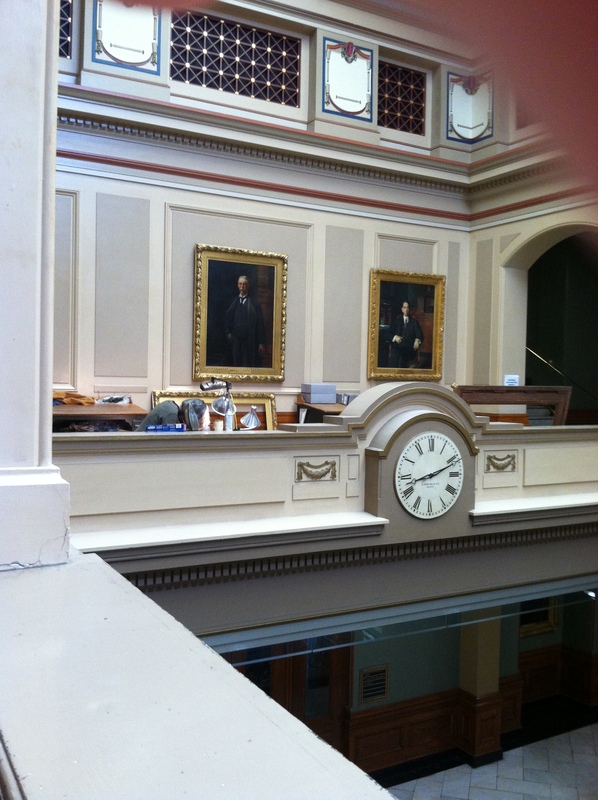 There are portraits everywhere; the ones I saw were mostly of former mayors. The center stairway is lovely and most floors have large hallways that circle it. I got up to the fifth floor. It is mostly for current and past probate. I’ve looked at records there before. I wandered around looking for something about Archives. 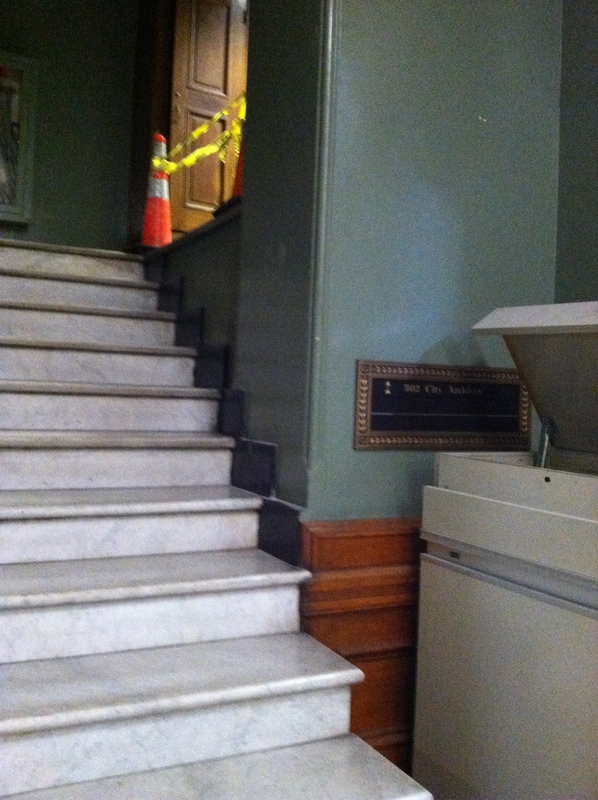 Then I noticed at the end of the hall a sign for “City Archives” pointing up another set of marble stairs. 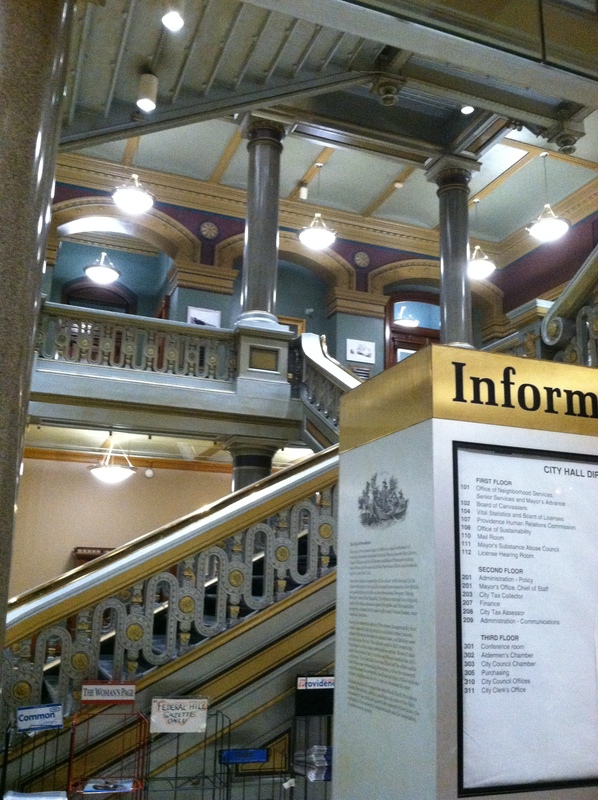 The City Archives is located in the top dome of the city hall and includes two floors. There are some archive rooms and a gallery storage area. Yes. It was this cool. Note the upper level. The City of Providence was founded in 1636. So the archivists have a big job. 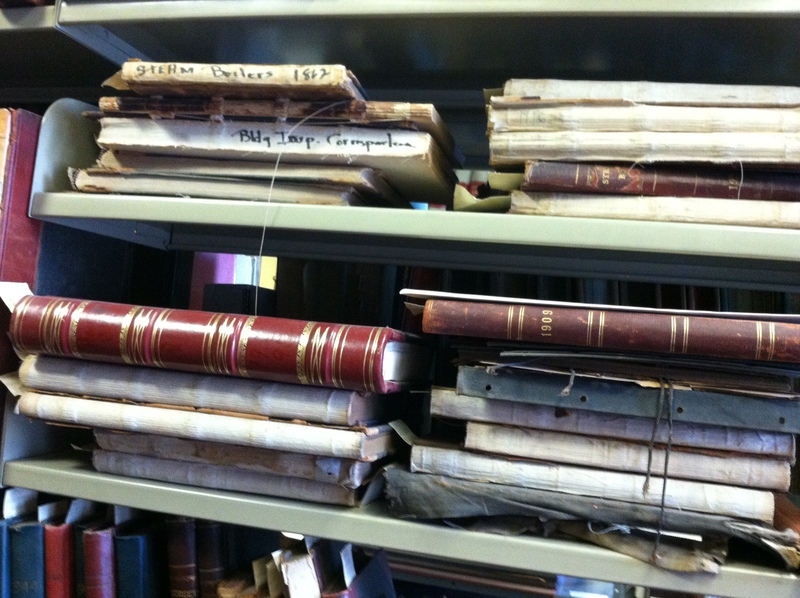 I have heard recently – I think in the Rhode Island Genealogical Society newsletter – that they have a wonderful archivist in charge, doing excellent work. I walked in and was met by the Archival Assistant. 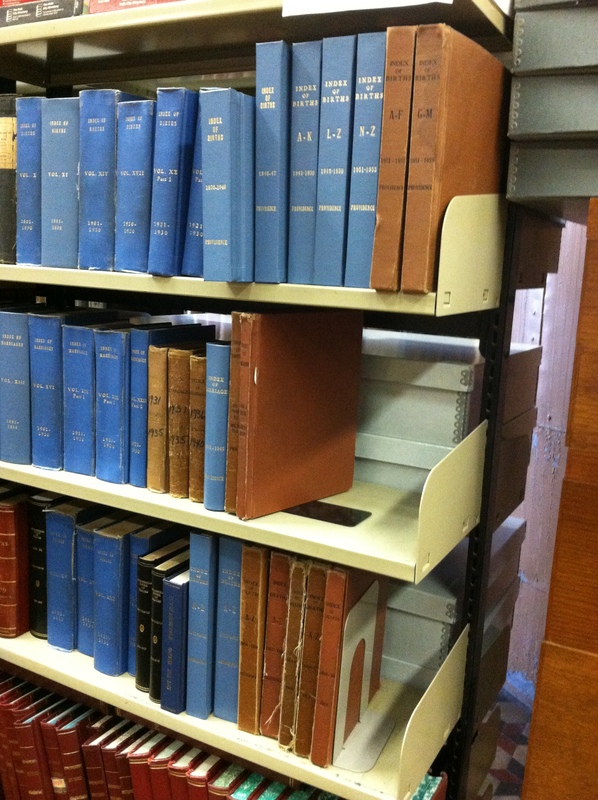 He showed me the normal archives routine – lockers, no bags to be brought in, sign in, etc. There were other patrons, so I looked around a bit while I was waiting. I noticed this plat book right away. He showed me where to find the death record in the index books. Jessie Ruth Murdock died May 5, 1936. The record names her parents, William & Rachel McLeod. I was hoping for Rachel’s maiden name. Drat. My luck ran out. No new details in Jessie’s death record. Jessie was my mom’s great grandmother, and died too early for mom to really remember her. After a last look around at records I didn’t have time to investigate, I had to leave. I’ll be back, probate records. I’ll be back. 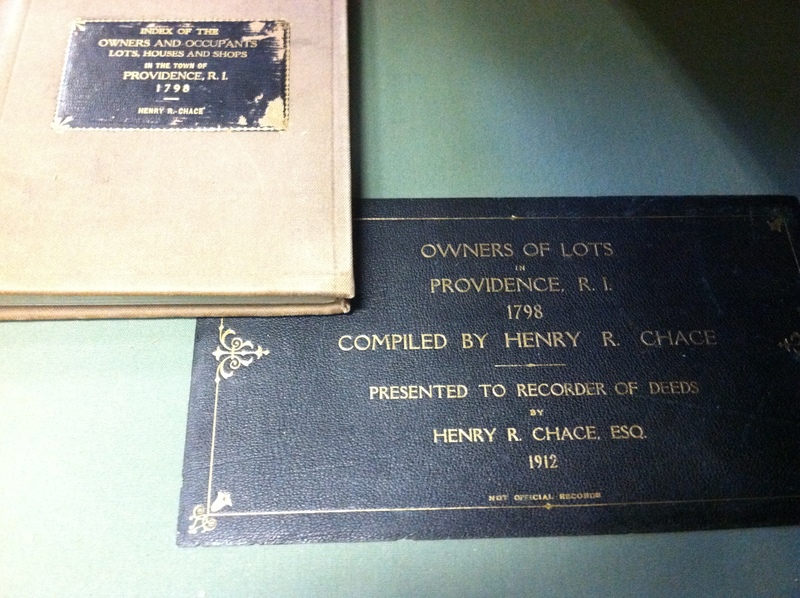 This large book Owners of Lots in Providence R.I. 1798 was accompanied by an index. Unfortunately, my ancestors had left Providence by 1798, and hadn’t yet returned. The research possibilities are endless. The top volume reads Steam Boilers 1862. 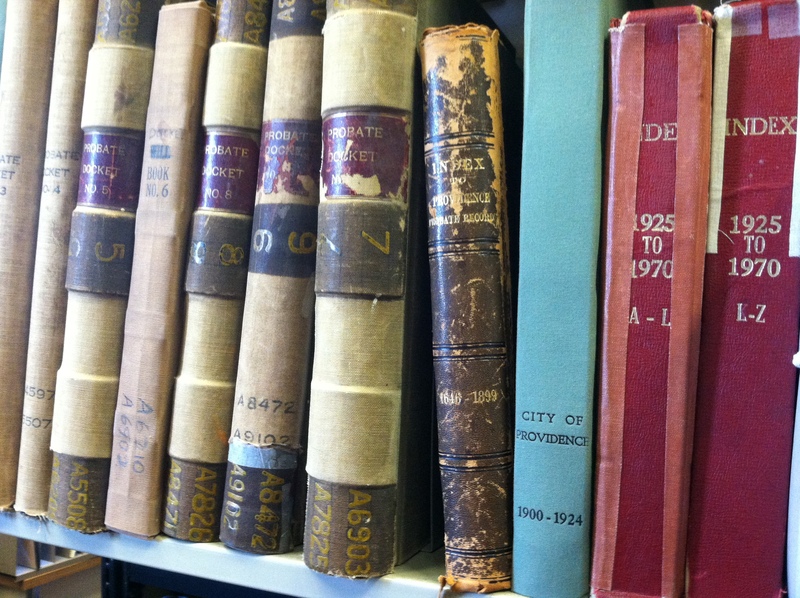 To learn more about the City Archives, visit the City Archives web page, see their useful “Basic Holdings Summary”, their Policies and Procedures, and their hours. They have begun to compile Research Aids which can be viewed on their Research page. The web pages also contain an interesting history of the city and a history of city hall, information on the various mayors, and some pictures of Providence. The staff were friendly and helpful. They can be reached through this form: http://www.providenceri.com/archives/contact. They also invite you to like their Facebook page Providence City Archives and view their images on FLICKR. I’m sure I will be visiting again soon to investigate some items I noticed in the Basic Holdings Summary. Diane, I wish I could make up an ancestor with Rhode Island roots, just so I could research there. What a lovely building (and no people around). Thanks for sharing your day with us. Mitch, you are too kind. It is always so nice to hear from you. Since we were in communication, I have learned a lot about Louis Murdock’s wife, Jessie (the person whose record I searched for during this outing). If you see this, could you let me know if you see the name Rachel, at all, among all your Murdocks (even as a spouse)? I sometimes wonder if Jessie’s mother, and her husband’s family, were tied somehow. Thank you for the wonderful description of our beautiful city hall and also the archives. As the city clerk, I had the honor of appointing Paul Cambpell to serve as the city archivist about 6 years back. Paul has so changed the way the archives is run and I can’t be more proud of the work he has done and his staff. Thank you again for sharing your thoughs! Thank you so much for the comment. And thank you for your efforts to help people access the amazing history of one of America’s oldest and most interesting cities. I just stumbled across your website and I’m so glad I did. It seems like every family I’m researching has Rhode Island roots. 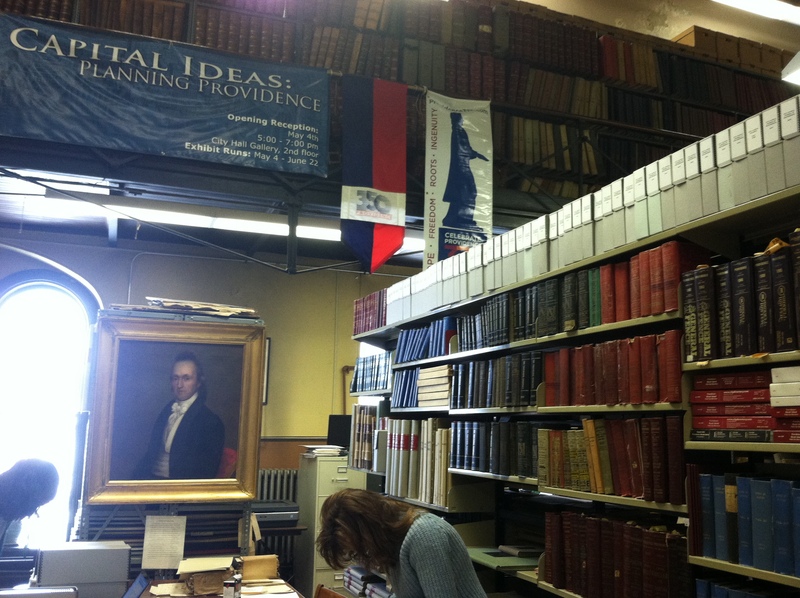 I can’t wait to visit Providence City Archives! Thank you for the helpful links and record books! Loved this post! You generate such hope! Another angel to genealogists is Ken Carlson, Reference Archivist in the Office of Secretary of State in RI, who demonstrates the same generous spirit as you’ve described in Nathan Lavigne. I’m searching for parents and g-parents in Westerly of our family’s John Crandall/Crandle who eventually marries Elisabeth Pratt in Dighton, MA circa 1751. Not there yet but Mr. Carlson is a wonder! Thanks for the tip, I appreciate you leaving the note here. Oh, that looks like such a fun day. I am jealous! Thanks! It was a pleasant surprise. I can’t wait to go back.